One of our 1st grade teachers at school had a baby last spring. She had to go on maternity leave early and we didn’t get to throw her a shower. So this week, we did. 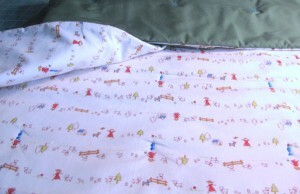 I made her little girl Shayne this baby blanket, using my “Mary Had a Little Lamb” fabric. I haven’t made one of these blankets since India’s blanket back in February. This is the 5th one I’ve made, and this time I used a thin cotton batting instead of the extra loft synthetic. I doubled it over to make it a little thicker, and it made me crazy. It just didn’t sew up as neat and easy as the other blankets, so I have to think hard about how I’ll make these in the future. I want to make one with a pieced top, like an actual quilt, but I haven’t had time yet. That’s the beauty of this blanket; it’s a great last-minute gift.